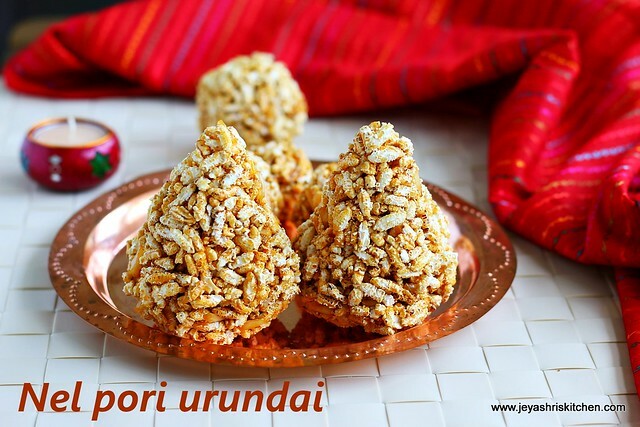 Nel pori urundai is the traditional recipe we make for Karthigai deepam. Karthigai deepam is celebrated in Tamilnadu and we lit lamps in the houses. Karthigai deepam 2016 is on Dec 12. We make pori urundai and in the traditional brahmin houses,we make paruppu thengai first and then proceed with making of balls. Some houses they do not make urundais, they just mix the pori with jaggery syrup and offer as neivedhyam. Recently in my skype class i took the session on making of pori urundai using nel pori and paruppu thengai too. 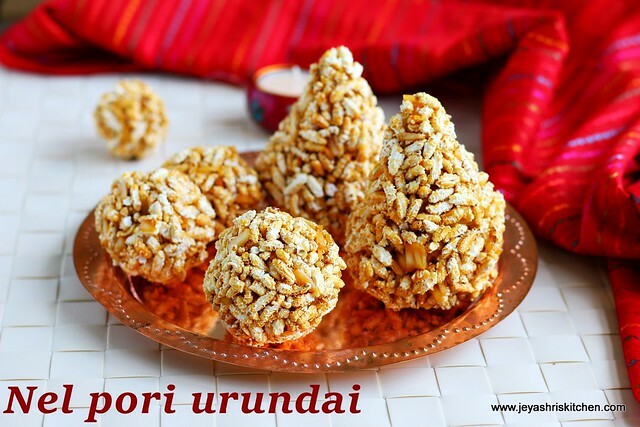 I have already posted pori urundai recipe but that was made with the puffed rice, which we use for bhel puri. We also make aval pori urundai for karthigai deepam. For all types of pori, we use the same proportion and method, as mentioned in the recipe below. Check out my other karthigai deepam recipes. Clean 3 cups of nel pori and keep this in a wide plate. In a pan add jaggery and add 1/4 cup water. Melt the jaggery. Always use powdered jaggery for correct measurements. Once it is completely melted filter the syrup for impurities. Boil the syrup again and allow this to boil until it forms a thick syrup. Add the dry ginger powder, cardamom powder and coconut bits. You can roast the coconut bits in ghee also and add . Check the hard ball consistency of the syrup by taking few drops of the syrup and dissolving it in a smal bowl of water. If the jaggery forms a mass and when you put that mass on a plate is should create sound. Pour the jaggery syrup on the pori and mix it well evenly using a ladle. Grease hands with ghee and start making pori urundais and paruppu thengai when it is warm enough to handle. For making paruppu thengai take a big portion of the mixture and make the triangle shape. For pori urundais take a small portion and make balls. When you come to the end of making balls, the syrup will get hardened and you will find it difficult to gather it and make a ball. Keep the mixture on the flame for 10 seconds and the start making the balls. the jaggery will get slightly melted and you can make the balls easily. If the syrup is not in the right hard ball consistency, you can not make balls. This can not be altered too. For all varieties of pori this is the proportion of jaggery.